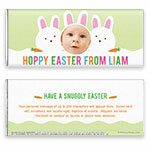 Your own adorable bunny is the star of this wrapper! Design: Adorable bunnies with photo space and colourful text. Personalization: Front photo and message, back title and message. Recommended Photo Size: 348 W x 348 H pixels.